In 2014, I fell in love over Tokaido. At the time, I had just started dating someone who I met in college. We warmed up to each other and decided to spend some of winter break with their family in Chicago. Upon arriving, I was surprised with a Christmas present; a copy of Tokaido. We tore open the box and were playing in no time, whether it be with their parents, their brother, or just the two of us. As the weekend went on, I found that with each movement of our meeples we moved closer and closer together, bonding as we chatted over the game, laughing at our inability to pronounce various words, and finding ourselves unable to see a life without each other. By the time that relationship ended some two and a half years and a failed engagement later, we had grown tired of Tokaido. We deemed it too simple, too obvious, a game of style with too little substance. We had tread that road too many times and didn’t want to return. But something changed when a few weeks back I felt a renewed urge to tour an ancient Japanese Highway. Thus with much more experience granting a new lens, I decided to see what destinations I’d discover in Tokaido Deluxe Edition. Note: The miniatures and board in these pictures are from the Deluxe Edition of Tokaido; the minis are purely cosmetic and available to owners of the base game through expansions. The extended board, which combines expansion content, as well as the higher quality cards, are the only exclusive pieces of content to this edition. The store allows you to purchase between zero and three trinkets drawn off the top of the deck. Collecting a set containing each of the four types can earn you up to 16 points. The shrine will allow you to make donations; you’ll get one point for each coin donated and up to 10 at the end of the game for having the most coins donated. The spa will earn you two or three points depending on the card you draw into. The bank will let you replenish your money, earning you three more coins to spend. The three panorama locations will allow you to paint parts of their respective landscape; earn points for each section you paint, and get a bonus if you’re the first to finish that panorama. The travellers location helps you meet others on the trail, providing you with a random bonus related to one of the other actions. Each of these actions have their strengths and weaknesses, but how helpful one spot may be over another is dependant on the movement mechanic. To throw another wrench into your axles, each player has their own entirely unique characters, providing abilities that may buff certain actions, reduce the cost of certain items, or provide additional points in specific categories. These characters also determine how much money each player starts with, establishing how flexible you can be early on. Rather than taking traditional turn order, whoever is furthest back on the path takes a turn, taking their pawn and moving it up the path to a spot of their choice, blocking others from using that spot alla worker placement games. Additionally, players can move as far up the path as they choose up until the next tavern, where everyone is forced to stay the night. This means that some players may get multiple turns in a row if everyone else passes over enough spaces, leaving one person behind. This is further helped by the double spots; some locations can have up to two stopping points, depending on the player count. The first player to reach the destination must take the primary spot, whereas the second person will take the spot jutting out from that location. Despite having reached that spot second, they are considered further back on the path, and will get to take another turn sooner. This results in players being forced to weigh out their options; do I go to this spot, knowing that someone else will come along and leapfrog over me in a few turns? Thus, a big aspect of how the game plays out is jockeying for a good position, setting yourself up for strong plays down the road while also keeping in mind that players can block you out of specific locations. When the first player reaches a respective inn, they draw a certain number of meal cards, depending on the number of players. Each meal, regardless of the cost, is worth 6 points, meaning you need to partake in meals or risk losing a ton of points. This may sound simple enough until you realize that each time someone buys a meal, the next person will be purchasing from the same pool of options, limiting what they may be able to afford. Additionally, you cannot eat the same meal twice over the course of the game (we, being connoisseurs of the Japanese palette, would not dare to experience the same food twice). he last attendee will get two meager options to select from, but, like the rest of the movement in the game, they’ll also be the first to leave the inn the following round. Once everyone reaches and resolves the last inn, the game concludes, with players adding up their points, but not before a few awards are given. Players who have the most spa cards, friend cards, store cards, and the most expensive food will receive an additional 3 points, potentially pulling you into the lead at the last second. 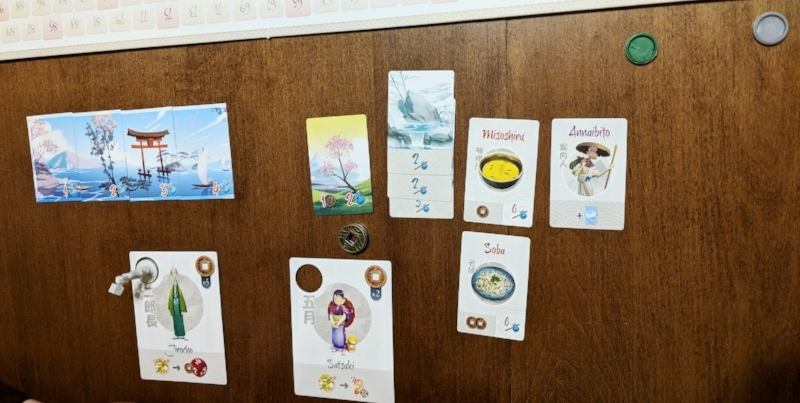 As you look back on the journey, though, some things can become pretty clear; while Tokaido actively asks you to make choices, those choices aren’t often terribly meaningful. Often, when looking further down the road, there are one or two locations that will stand out to you as your best options. And unless you’re looking to sit around waiting 6 minutes for your next turn, it’s unlikely that you’ll want to jump too far ahead, usually helping to make your next play fairly obvious. Sure, going on a vacation is supposed to be relaxing, but in my eyes, it should also be interesting. 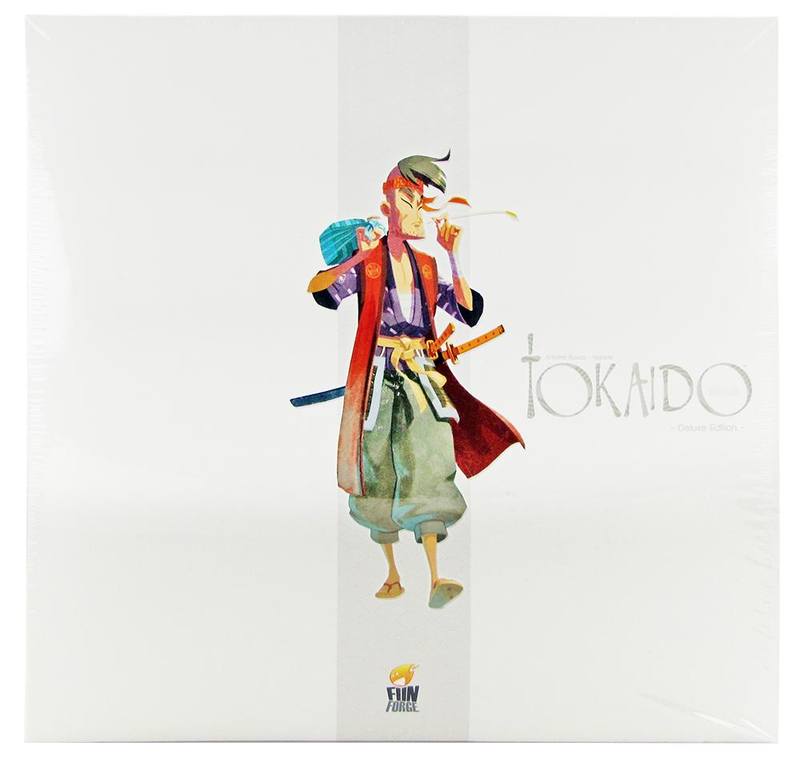 I should want to be there, with the days holding a certain amount of excitement and anticipation for what comes next; Tokaido doesn’t really do that… at least, not in the base game. 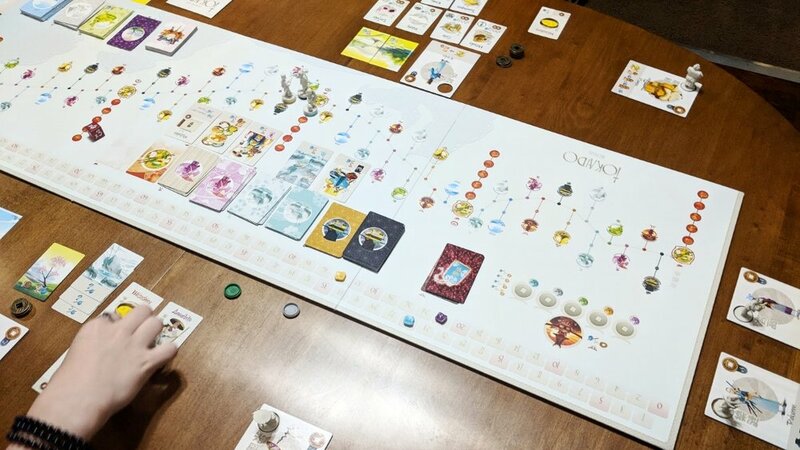 Tokaido: Crossroads brings a cavalcade of options to the table, turning what was once a rather straightforward, sometimes absent minded game into something worthy of repeated exploration. The store now houses legendary items; instead of drawing blindly from a deck, you may select and purchase any single legendary item, either capitalizing on your item card collection or giving you bulk points. The shrine is now giving out talismans which you can buy; spend a coin to the bank, and you can choose one of these passive abilities that you can use to buff a future turn. The spa has recently been upgraded; pay a coin and you can go to the bath house, awarding 4 points consistently as opposed to 2 or 3. The bank now houses a gambling house; spend two coins and see if you earn more than you would normally, just break even, or lose it all. The three panorama locations feature some beautiful cherry trees; take one of these and earn 2 victory points and a precious coin. The travellers location now provides some long-term goals; pay a coin, and you can select one, potentially earning you a bundle points end-game. In this way, Crossroads not only provides some flexibility and decision-making, but the options themselves revolve around making meaningful decisions; a stark contrast to many of the luck-of-the-draw base game actions. 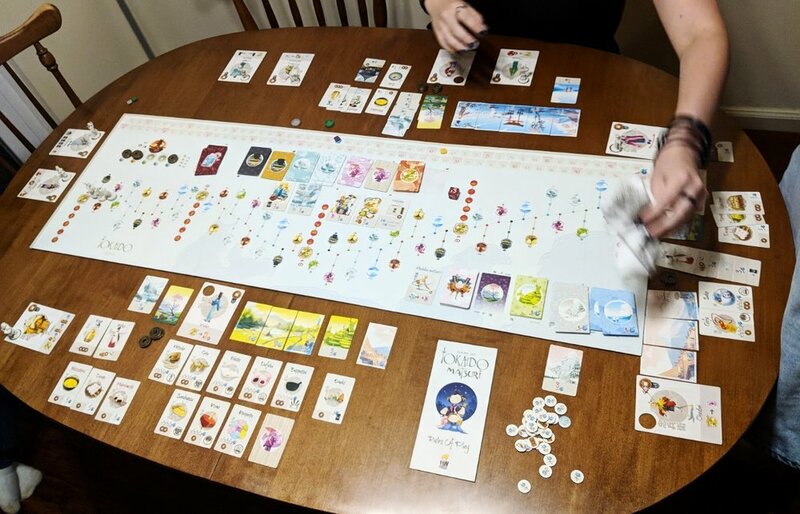 Not to say the new actions are inherently better than the old ones, far from it, simply that they promote a different way of approaching the game, one that makes Tokaido a far more complete and varied experience. Tokaido has its faults, sure, but they’re more about how you approach than it is about the content. Even with the added choices brought on by Crossroads, there isn’t an extreme amount of depth to the game. and some victories will amount to a lucky draw. That doesn’t make this a bad game, only one that relies on chance a little more than some, like myself, care for. Similarly, some character abilities will inevitably be better than others. I don’t mind this all too much, though, as the variety is helpful in providing this game with a bit more staying power. For a time, I distanced myself from this game, not because of its content, but what it represented. In my eyes, it was a door someone slammed shut in my face, cutting off a path that I once viewed as a happy inevitability. I was set in my ways, both good in bad, and I saw only one way to move forward. Since then, I’ve found that perhaps this jarring transition is exactly what I needed; life doesn’t always work out for you, and you need to be willing to adapt, work with what life has to offer, and don’t dwell on the things that don’t go your way. Tokaido is a game about choosing your path, if only for a moment. It acknowledges that you won’t have time for everything in life, and that sometimes you need to make difficult choices about what you want out of it. You may get stymied out of those precious coins or panorama cards you desperately need, but you’ll find other ways of making ends meet. And even when you’re stuck in the far back, there’s only one way to go; forward. It is, at its core, an art piece, and one that I celebrate, keeping it not just as a melancholy journey to travel from time to time, but as a reminder of how far I’ve come and where I’m going next. Who Should Get This Game: Players willing to embrace the now, people who want a relaxing experience.